I have been stuck in the Photographic Doldrums for the past couple of months, so I have been spending quite a bit of time searching my archived images. I’m not one to live in the past, but I’ve found that it can be rewarding to revisit my older work. I have rediscovered some of my best work rummaging around in old files. I have also found photographs that, for some reason didn’t make the cut when I first edited them, but over time, with my ever-changing vision and some changes in my workflow, they suddenly take on a new life. 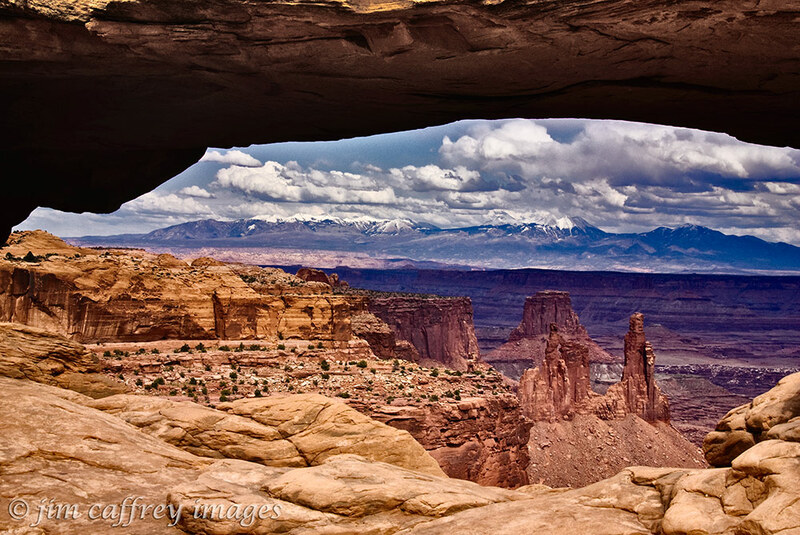 This first image was taken in Canyonlands National Park in Utah. Mesa Arch is an iconic location for landscape photographers, but the shot almost everyone takes is of the sun rising behind the arch. Being a bit of a crank, and wanting to make an image that spoke of my vision and not some other photographer’s, I made this photograph in the late afternoon and used the arch to frame the incredible landscape that lies beyond it. 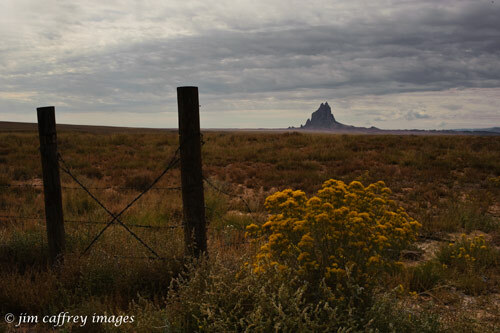 I made this image of Shiprock while driving to Utah a couple of years ago. I was drawn by the bright yellow rabbitbrush and I was also going through what I like to think of as my “fence phase”. These two elements made the perfect foreground for the great volcanic plug and brooding skies. 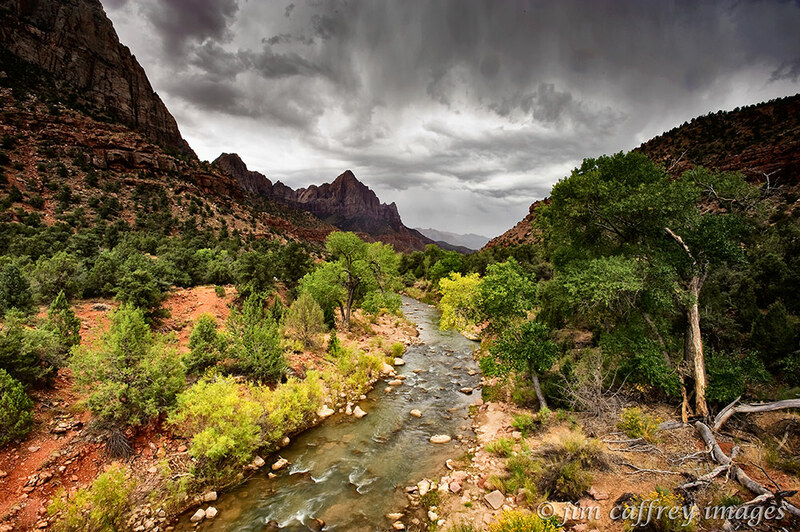 This is an image of the Virgin River in Zion National Park. The overcast settled lower and by the next morning, the rain was continuous, making my hike to the Subway impossible due to high water and flash flooding. But this moment, looking down canyon with the soft light penetrating the swollen sky is one of my best images from that trip. 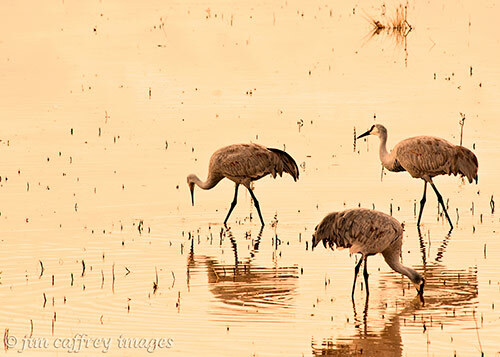 Twilight at Chupadera Pond in Bosque del Apache NWR. These three cranes were hunting for their dinner. They had just flown back from a day of foraging in the farm fields at the northern end of the refuge and now they were continuing their seemingly endless search for food in the pond where they would spend the night. The color of the light in this image has not been altered. For one magical moment between sunset and the onset of night, the entire landscape was bathed in this golden-orange glow. 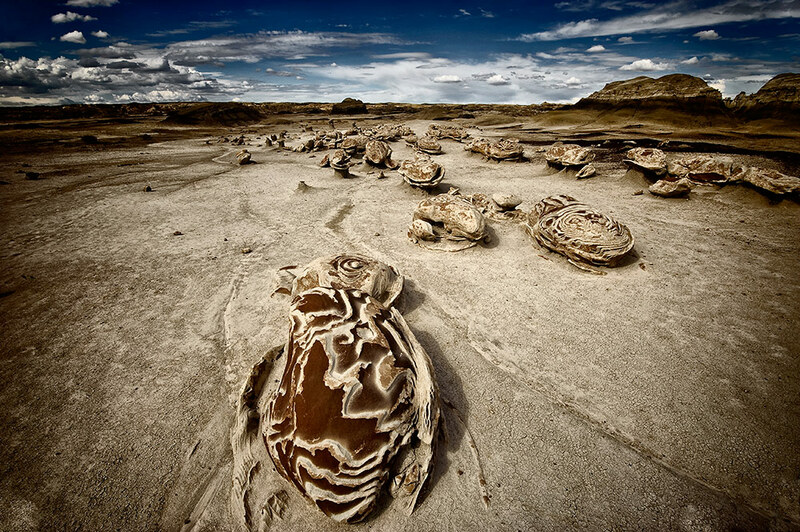 This final image of the Egg Garden in the Bisti Wilderness has gone through numerous iterations and I think I finally have it just where I want it. I know the composition goes against the venerable “Rule of Thirds”, but sometimes it’s good to break the rules, and sometimes it’s good to revisit the past. I was awakened this morning by the sound of thunder–not a good sign. The rain started yesterday, and has been pretty much continuous since then. 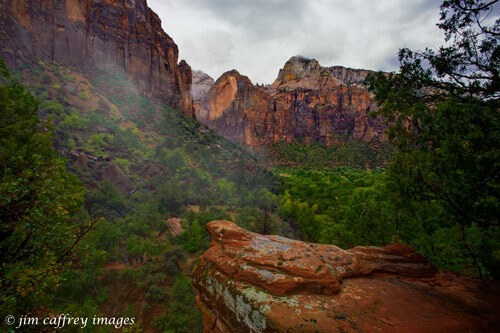 I had spent the day exploring Zion, and had even made a drive up to the trailhead where the hike to the Subway begins, but I was growing doubtful that I would be able to make it due to the weather. The Subway is situated in a five hundred foot deep canyon on the western edge of the park. In order to reach it you must hike about a mile along the wooded rim, and then drop into the canyon on a steep switchback trail which brings you to the left fork of North Creek. From that point on you must make your way three miles upstream, boulder hopping and wading the creek most of the way. If you are down in a narrow canyon such as this, and rain is falling in the high country above you, there is a high potential for a flash flood. Many people have lost their lives in flash floods, and I was not too keen on the idea of becoming one of them. So, this morning I headed out at about six thirty to weigh my options. As I drove up the Kolob Terrace road toward the trailhead, I caught a glimpse of North Creek. It was running at least six times higher than it was yesterday, and the water was a thick soup of reddish brown mud and debris which told me all I needed to know: the Subway was inaccessible. The hike was off. Being the philosophical sort, I decided not to dwell on something I had no control over, so I headed to park headquarters to obtain a rain check so I would be able to return on some future date. I then took the park shuttle into the upper reaches of Zion to see what I could see. The first trail I hiked was at The Temple Of SInawava. 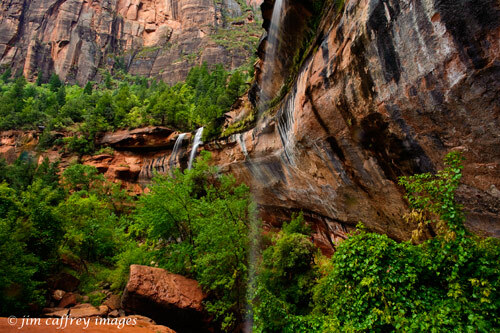 Named for a Piaute prince, this is the area of the park where the canyon begins to get narrower. 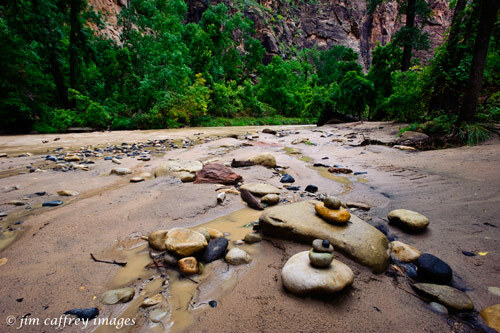 The trail follows the edge of the Virgin River for a little over a mile before it dead ends. It was here that I found these cairns, but I prefer to think of them as river offerings. By the time I reached the end of the trail and turned around, it was raining hard. I took the time to put my camera and lenses into ziplock bags and fit the all weather cover over my backpack before heading back. My next stop was the Zion Lodge and the trailhead for the Emerald Pools hike. 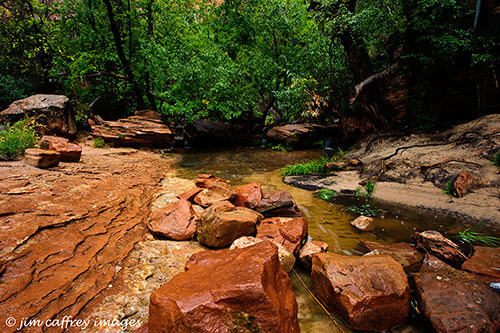 These three pools are located in Heaps Canyon which is a side canyon off Zion Canyon. The trail is about four miles round trip, and, once again, it began to rain. The first pool is situated below a one hundred foot high shelf of sandstone which was shedding a large amount of run-off in the form of two waterfalls. I made this image after passing under the falls to continue up to the second, or middle pool. From here, the trail ascends steeply to the top of the shelf where the next pool is located. It is a truly beautiful place. The water runs calmly over the slickrock at a depth of no more than an inch in most places. This photo shows the stream which feeds one of the waterfalls just before it plunges over the edge. There is another small flow much like this one further along the trail where it heads back down to the lodge. About half way between the two watercourses, the trail forks off to the third and highest of the three pools. This part of the hike is quite a bit more strenuous than the lower section, and the footing is tricky in places. At this point, the ever-present rain became a downpour, and the trail was now getting slick with mud. But, I really needed to see that last pool. I just knew it would be a great photo. Unfortunately, the combination of the now heavy rain, and the blowing mist at the bottom of the falls above the pool made it impossible to even set up a shot. I lingered hopefully for about twenty minutes, but the rain began to come down even harder, so I finally gave up and started down. When I got back to the middle pool, there were about ten people there, and the rain had let up. I began to set up a shot about ten feet from the edge of the shelf. I was having a conversation with a young woman from Michigan when I noticed that my pack, which I had set down beside me on dry ground, was now sitting in about a half inch of water. I looked around, temporarily confused, and then it hit me: this peaceful little flow, swollen by the heavy rain, was about to flash. I told the woman to get moving, and we both grabbed her young daughter. By now the water was about six inches deep, and rising. We reached higher ground just as the debris came roaring down the stream bed. We had made it to safety, but we were now between the two flows, and both of them were, suddenly, raging torrents. There was no way out. We were stranded, at least for a while. As it turned out, there were about twenty people stuck on that wedge of (relatively) dry land between the two streams. We spent about two hours there, and I think we all developed a bond. We passed the time by talking and joking. I made one more image, not one of my best, but certainly one of my most memorable! Then the water levels slowly returned to normal, and we all went about our lives. I was up at 4:30 AM. loading my cooler, and making sure I had everything I would need (or so I thought). By 6:15 I was on the road. The route I had chosen took me up New Mexico SR 44 (sometimes referred to as US 550). I made a quick stop at the Cuban Cafe in (where else?) Cuba, NM for a hand-held breakfast burrito, and I was off again. SR 44 crosses the northwest plateau between Cuba and Bloomfield where it drops into the San Juan River valley. At Bloomfield I took US 64 west through Shiprock, where I entered the Navajo Nation. 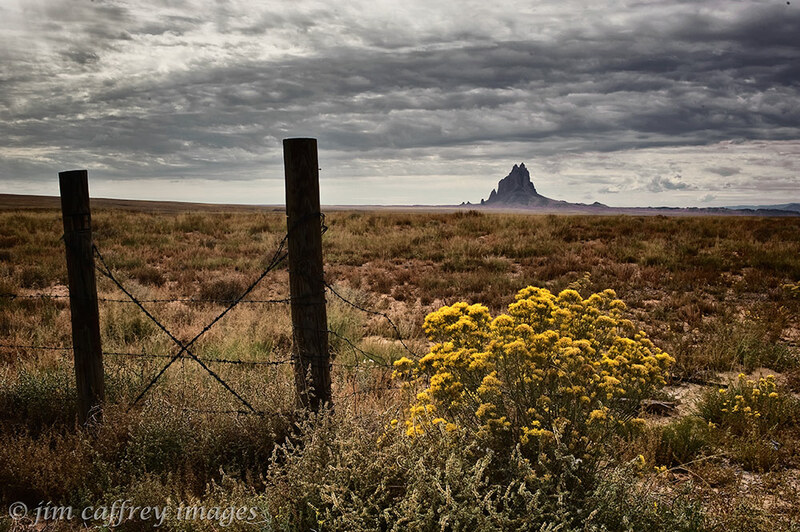 Shiprock is the remnants of a dormant volcano, and is sacred to the Navajo people. I made this image as I drove past on Hwy. 64. The road now dropped into Red Valley, and I was soon across the Arizona border in the small village of Tec Nos Pos. From there it was a short drive to Kayenta: the gateway to Monument Valley. 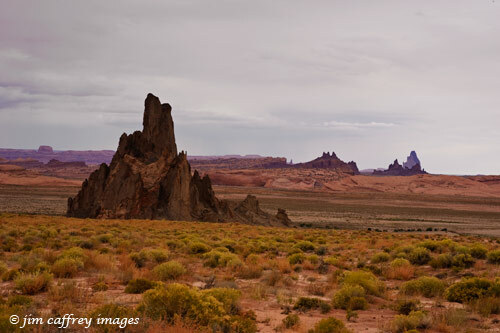 As I topped a rise before entering the town I saw an amazing vista off to the north, and I stopped to make this image of more exposed lava plugs similar to Shiprock. Monument Valley lies beyond the distant spires, about twenty miles to the north. 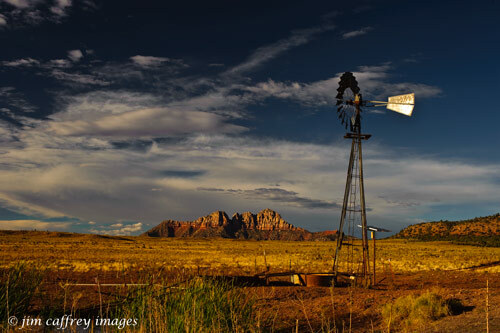 I made another stop in Kayenta for gas and some lunch, and then I continued on to the west until I came to Arizona State Road 98, which angles northwest past the small villages of Shonto and Kaibito. It was here that I noticed another change in the geology of the landscape. I began to see a lot of eroded, cross-bedded sandstone, so once again, I found myself parked by the roadside composing a photo. 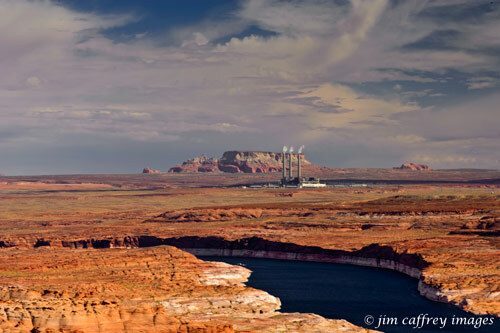 This image was made just north of Kaibito, and I was getting pretty excited because I was now very close to the Glen Canyon Dam where I would cross into Utah. Next stop, Kanab, Utah where I would have to detour back down into Arizona before I reached my final destination. 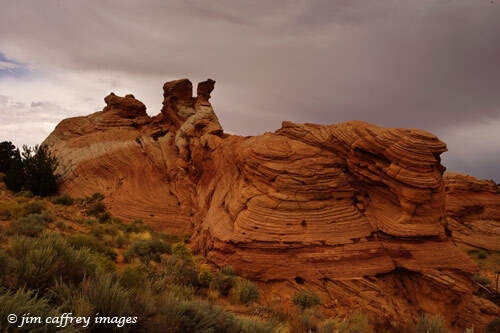 As I neared Kanab, the overcast became a black curtain, and the rain came down in sheets. It was pretty intense for about fifteen minutes, and then the rain stopped as suddenly as it began. I pulled over to the shoulder to look behind me at the storm as it moved to the northeast. 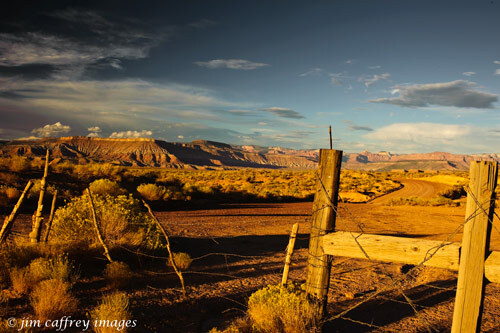 I took this photo on the yellow line of Utah SR 89 about ten miles east of Kanab. 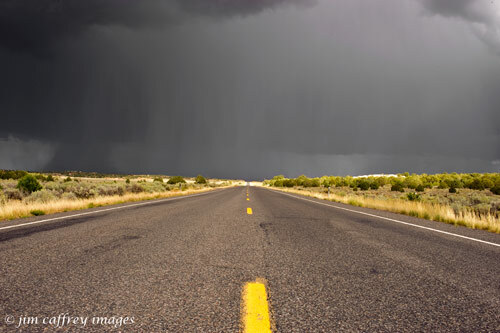 I continued down the two–lane blacktop through the town of Kanab, and back down into Arizona where I headed west once more from the small town of Fredonia. I was getting really close now, I was also getting weary. I had been on the road for more than twelve hours. At Colorado City, Arizona, I crossed back into Utah, and stopped just a couple hundred feet over the line the make another image. Twenty miles to go, and the sun was getting low in the west. I could see the town of Hurricane, Utah as I drove past what would become my last image of the day. It had been a long day, and I had journeyed through some beautiful country, but the fun was just beginning!